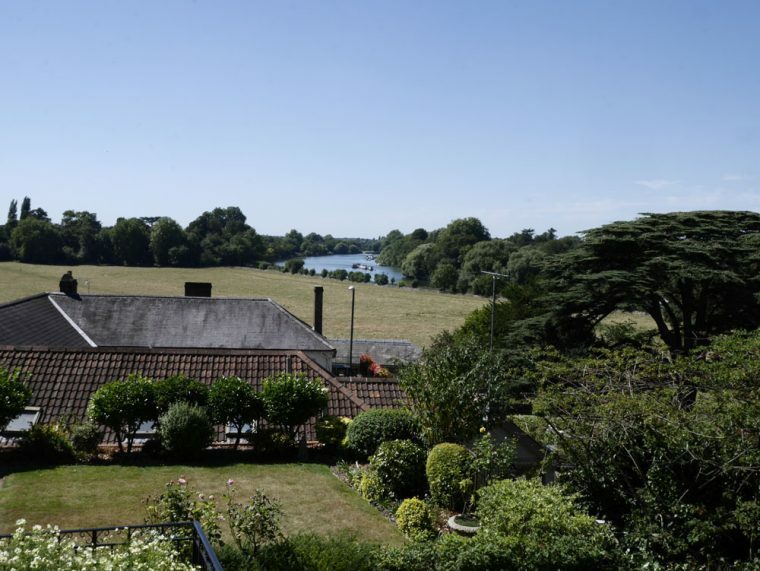 The Petersham dining room does have something of a strategic advantage – dining looking out through floor to ceiling windows, at the view of the Thames which inspired Turner to paint the meadows is always a joy. I last visted The Petersham in the summer, before the recent makeover, and was suitably impressed then. Now, the new refurbishment helps by paying tribute to the landscape, with a colour scheme of deep blues and soft greys. And, strategically placed mirrors bring the natural daylight indoors creating a relaxing, light and contemporary room which is a pleasure to visit before you even eat a mouthful of food. My guest for a recent lunch at The Petersham lives locally. So locally that she can walk there (albeit, across the fields, with suitable footwear). She’d also held her wedding reception there, some thirty years ago. At that time the Hotel was already owned by the Dare family (Colin Dare acquired the property in 1978) – today Greville and Luana, his son and daughter run the place. 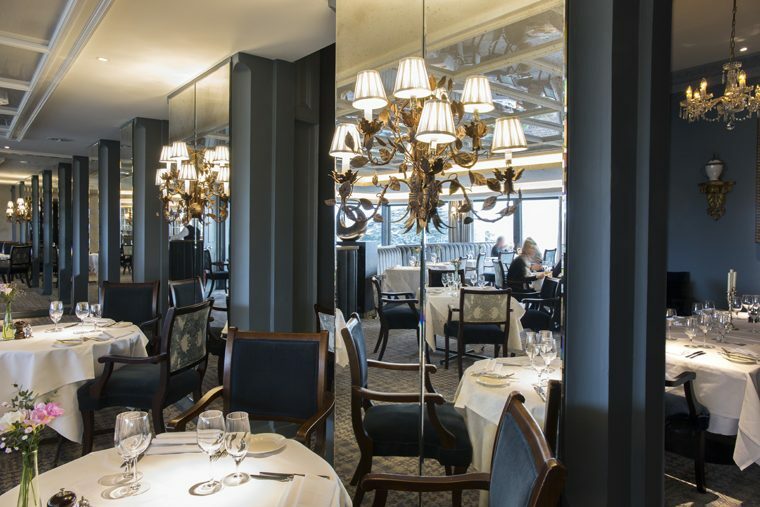 Over the forty years or so that the Dare family have owned the hotel, it has changed – she was as curious as me to see the newly refurbished space, and to try the new menu. 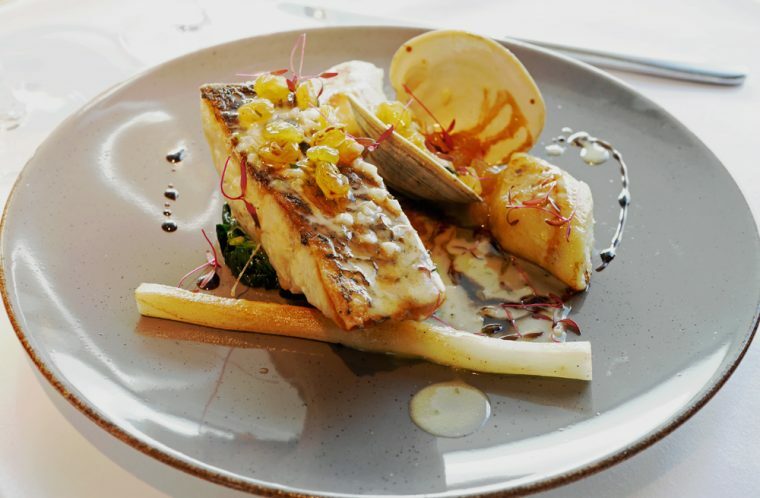 There are new dishes now which call out to be tried, as well as old favourites like the grilled whole Dover sole. 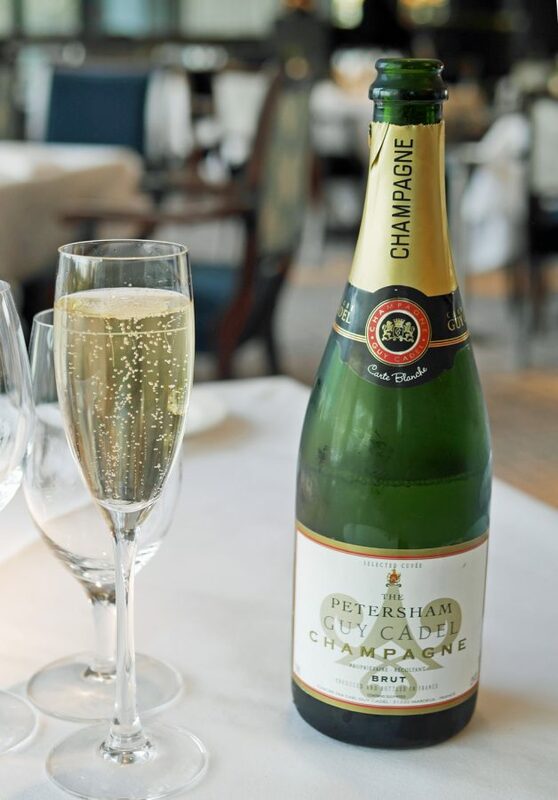 A glass of champagne always helps – and the Petersham has its own rather pleasant cuvée which is a lovely touch. An initial glance at the menu felt a little like groundhog day. 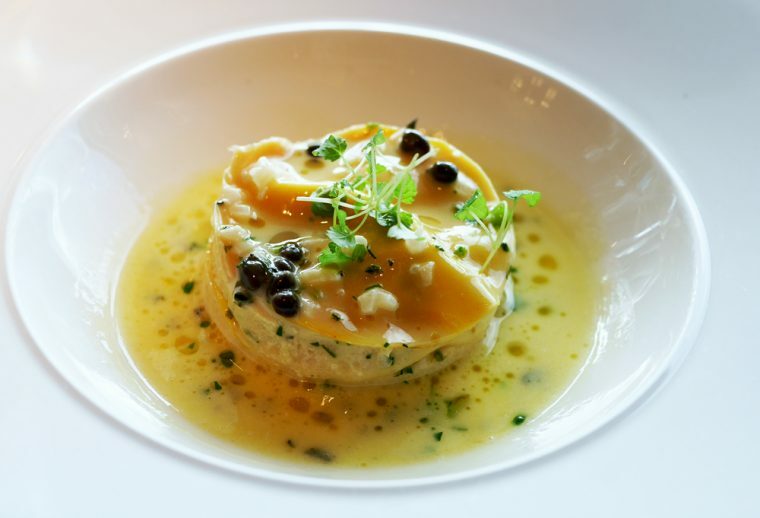 There, at the top of the starters was a steamed lasagne of Cornish crab – something my companion from the night before at Athenaeum had enjoyed. And, for whatever reason, I was drawn to the Hot Smoked Salmon, with beetroot textures, caviar, fennel and sea spaghetti. Of course, neither dish was the same as the version we’d tried at Galvin at the Athenaeum – but no less excellent for that. 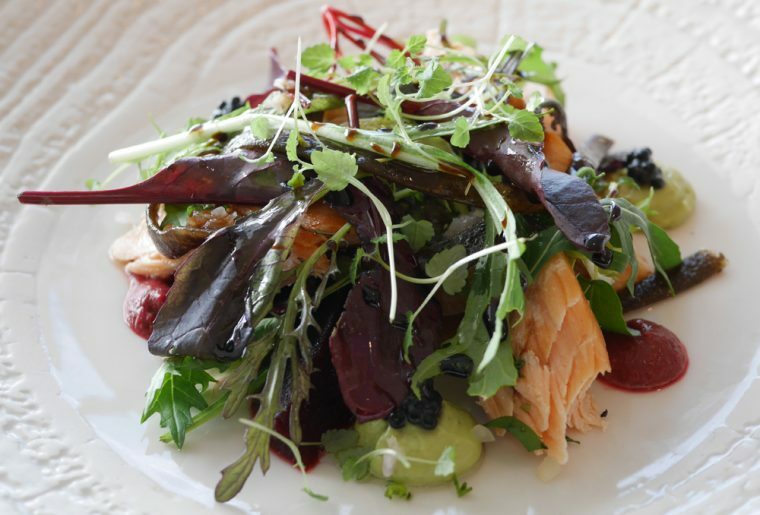 The lasagne of Cornish crab was delicate and beautifully presented, while my hot smoked salmon with beetroot textures was a delicious mixture of textures and flavours. Head Chef Adebola Adeshina took a few minutes from his kitchen to talk with us and I was intrigued to learn that he had indeed spent some time working for the Galvin Brothers at Bistro de Luxe and knew the crab lasagne that we’d enjoyed the night before. He does have something of a stellar CV, having worked with Philip Howard at The Square, Eric Chavot at The Capital and Tom Ilic at Bonds. He’s now been at The Petersham for a couple of years and it is clear that he has really found his feet. We both chose fish main courses. 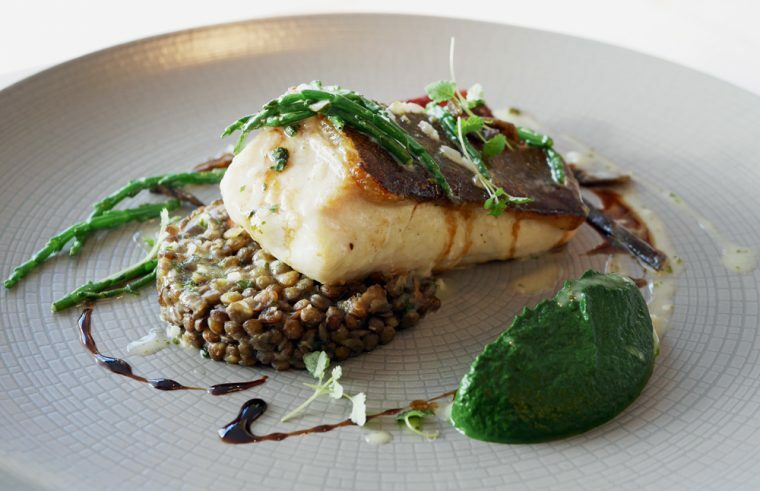 In my case a roast Scottish Halibut with watercress puree, chorizo, puy lentils and Pernod sauce, which I loved – although I would have preferred the chorizo to be chopped into the dish rather than left as one whole piece. Perfectly cooked fish is always a joy. My companion picked the pan fried stone bass with truffle and squash gnocchi, clams, salsify and sea shallots. She remarked how good the gnocchi was and how well balanced the plate was as a whole. For dessert, I picked the blueberry clafoutis with nutmeg ice cream. 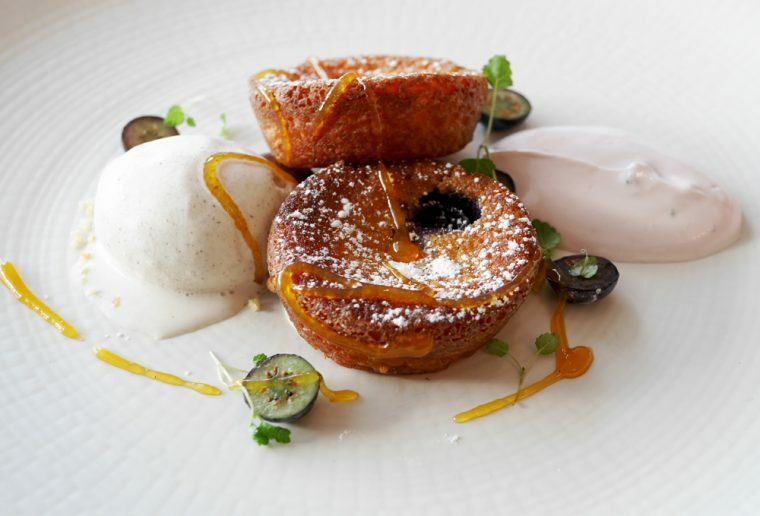 Ade warned us that it was served in the form of individual clafoutis – more like tiny sponge flans studded with blueberry. A beautiful dish, though, which I’d happily order again. My companion meanwhile picked the picture-perfect poached pear with port wine mousse and lemon sponge. Throughout the meal, we drank a half bottle of wine, a rather fine 2015 CHABLIS 1er Cru, Fourchaume, Malandes, Burgundy. I love the fact that the Petersham offers a good selection of half bottles – particularly at lunch a shared half bottle help me to avoid drinking TOO much. And, it’s lovely not to have to compromise on quality. Wow! This place looks amazing, and the food looks even better. I would love to visit here. I would love to dine as a guest here. The food looks tasty. Oh what a beautiful place! Very fancy! The food looks amazing too! Not only is the scenery amazing but the food looks impeccable and so fancy too. Just my kinda cuisine! This looks like an absolutely beautiful place to dine – the dishes look incredible! Wow! Amazing location and amazing food. 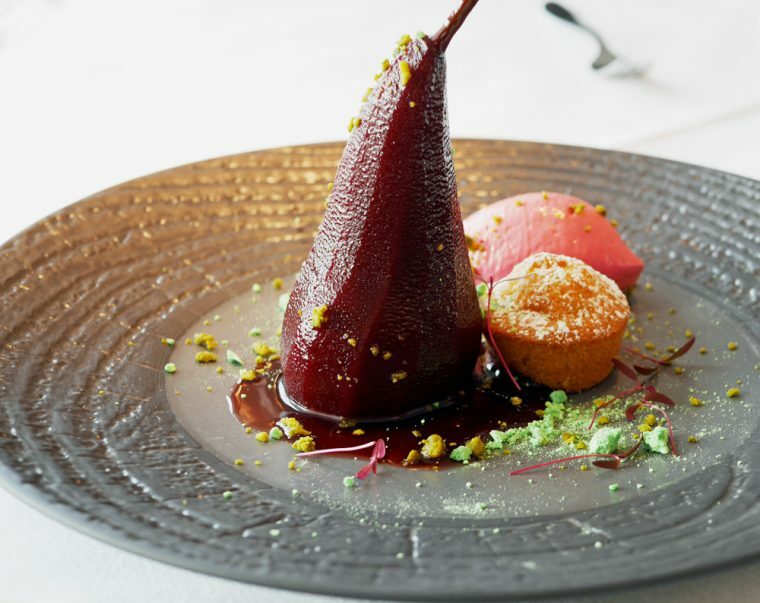 That poached pear looked incredible!